Are you a health fund member? If you are overdue for a dental clean and checkup, don’t waste your benefits. Most dental insurance funds offer no-gap dental cleaning once or twice a year; however, your benefits don’t roll over into the next year. Thus, you need to take advantage of your benefits NOW, before the year ends. We at United Smiles, our dental professionals and friendly team, will be pleased to work with patients into the schedule until the end of December. This helps our patients get maximum rebates and stunningly healthy smiles this 2015. Dentist Beveridge | United Smiles is proudly serving dental patients from Beveridge, Doreen and Mernda since 2013. United Smiles is a family-friendly dental practice comprised of dedicated and skilled dental professionals led by Dr. Halim Prayogo. We are looking forward to offering you with the highest standards of dental care through our extensive knowledge in modern dentistry and state-of-the-art dental technologies in our comfortable and welcoming environment. Our mission is to deliver an excellent dental care in the best way possible to help preserve your healthy smile for life. 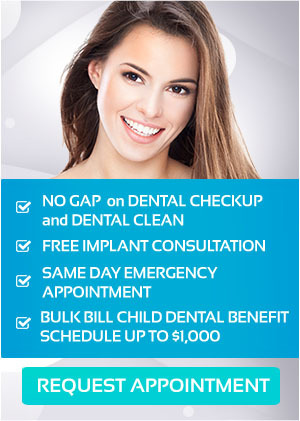 We offer a comprehensive range of dental treatments to cater the specific dental needs of your whole family. Whether you need a treatment for a simple dental pain, a solution for serious oral health disease or seeking a suitable procedure for your smile issues, rest assured you will be in good hands with us here at United Smiles. United Smiles provides a wide range list of preventive, general and cosmetic dentistry as well as oral surgery to meet the needs of your whole family. A straighter smile provides tremendous and remarkable benefits. Perfectly aligned teeth are healthier teeth. For teens and adults, we offer nearly invisible braces and clear aligners to correct different misalignment issues in a discreet way, so you can show your smile even under treatment. We encourage you and your family to make a major step for your oral health. Having healthy teeth signifies a healthy body and higher quality of life. We are highly dedicated to helping your entire family gain healthy smiles for life. To learn more about how our dental team at United Smiles can help improve your overall wellbeing for that radiantly healthy smile, feel free to call or visit our dental office located at the heart of Mernda Village. United Smiles is proudly serving patients from Beveridge, Doreen and Mernda since 2013.